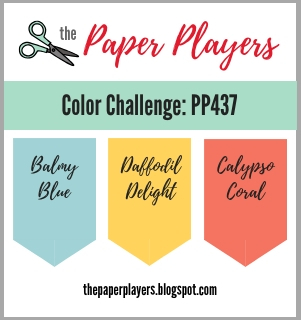 These aren't colors I would generally put together simply because I dislike Calypso Coral! :-). I don't have Balmy Blue in my stash, so had to make do. It took me a little while to determine what I was going to do - I SO wanted to do florals, but decided not to go all in on them. I also made a square card - mmmmmm... can't remember the last time I made a square card, but the stamp that I settled on needed one. I cut a piece of Neenah Solar White card stock to 5.25 x 2.52 and inked up the wreath stamp with Altenew's Sea Breeze ink. I had to stamp it several times to get the coverage that I wanted and also to match the Balmy Blue better. Once I had the wreath where I wanted it, I stamped the bird from the set with grey ink a couple of times and then fussy cut around it. I needed to add the Daffodil Delight, so the birdie has a Daffy belly. I stamped a sentiment from Altenew's Sincere Greetings set and cut it to size. When I looked at the wreath I thought it needed just a little more depth at the beginning of the leaves, so pulled out my Copic Marker and added some flicks to add the depth. Once I was happy with it, I took out my Nuvo drops and added the Calypso Coral element in the berries. I was in a rush, so I decided to try to harden the Nuvo drops with my heat gun. Mmmm. a couple of them did crack, so won't do that again! I did add some rhinestones to make 3 berries in the areas where there were only two. I also noticed a couple of areas that I thought a single rhinestone would look good. I adhered the sentiment with fun foam and did the same with the bird. I then cut the front piece down a quarter inch on both sides and mounted it to a Neenah Solar White base. Of course, I had to add a sentiment to the inside. I used Altenew's Beautiful Inside for the sentiment and added another stamped bird. As I don't have square envelopes, I used my envelope making board and used a piece of old Stamping' Up1 12x12 textured card stock to make an envelope. Well, it might have felt like Spring last weekend as we watched the very last of our snow melt. Mmm fast forward 3 days and we had 3 days of snow. It started on Wednesday and finished on Friday. We had everything from snow to rain to sleet to freezing rain, back to snow. Then we had a thunderstorm and it hailed! Then more snow. Oh... we also had 60 mph winds! In the end we had about 12-13 inches of snow and everything is covered in white again. I think it's going to be the end of next week before we see the ground again :-). However, the cold and snow did give me the perfect excuse to retreat to my craft room and make some cards. In addition to tonight's card, I also made a couple of cards using the Freshly Made Sketches sketch and I'll be back with one of those cards tomorrow. In the meantime, warm hugs and prayers for those of you who need a little lift tonight.